Two exquisite porcelain lace sisters with an "N" under five point crown and stamped letter S:- Hello, I have one of two "sister" figurines given to me by my grandmother who received them from her mother. The other belongs to my sister (photo of the woman in the violet dress) My great grandmother was born in the latter half of the 19th century. She is of Polish and English descent and travelled to Italy (as I have a few paintings from there)and other places in Europe. I have searched the forum and did find the post of the "N" under the crown here: https://www.google.com/url?q=https://www.figurines-sculpture.com/german-crown-mark-with-n-porcelain-mark-a-j-uffrecht-co-figurine.html&sa=U&ei=tryzT9_hMMK1twfzgY3cDA&ved=0CAsQFjAD&client=internal-uds-cse&usg=AFQjCNHYGAYH-diM7c6ZFLk8AR87iq7vUA. I then researched Uffrecht, Rudolstadt. The mark most closely resembles the Potschappel mark in that post, but the figurine does not resemble any of the items I could find by them. 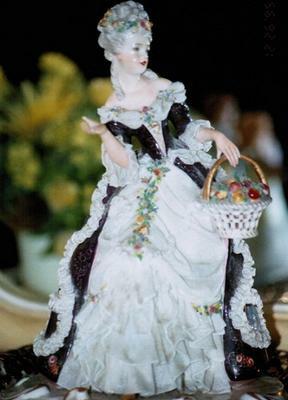 I could only find that Dresdon made porcelain lace figurines. But upon additional researching, I did not find any that match the sense of movement in the lace, detail of the painting and quality of the sculpture itself that these pieces have, and of coarse, there is no "Dresden" name on the figurine. They are extremely delicate and I can only keep a single layer paper towel draped over mine, where she sits quietly. She is about 12" tall. I have included a few photos. My grandmother did not remember where her mother got them and I have reached a dead end. Any help would be greatly appreciated! Thank you! PS If the photos did not upload I also have them in an album I put on Flickr here: http://www.flickr.com/photos/[email protected]/sets/72157629755943690/with/7209367664/. Hmmm. Interesting submission. Many thanks. My first impression was these are very lovely quality German 19th Century Dresden lace style figures, with an N mark, very characteristic of the Thuringian region at that period. Despite the Capodimonte mark, they are not at all Italian, even though your Grandma travelled to Italy - perhaps they were exported to Italy from Germany, thus explaining the export N mark of the German, Thuringian makers (just a guess). Thuringia was very good at doing the Dresden style, so it is not necessary to see the actual words 'Dresden' to have high quality Dresden lace figures. the city closest to the originators of European hard-paste Meissen. Elsewhere on this site, we discuss these makers, but they include, as you say, factories like Potschappel (Carl Thieme), and Rudolstadt(Ernst Bohne Söhne). When you look closely at this mark you can see the letters SM written into the device of the crown prongs. The are hundreds of different N marks with crowns, all in homage to the great early period of the Naples factory. Some of these are German, mainly, as I understand it, Thuringian from the late 19th Century. Some are Italian,mainly, as I understand it, from the 1920's onwards. To me, the figurines marked with a crowned N from Italy are decidedly different from the German 19th century style - at least the ones I have seen. Yours are very nice quality, very German looking. The 20th Century Italian figures are lesser quality to my eye and modelled in a more caricature styling with 20th century faces rather than 19th century faces. So this leads me onto the vexed question as to why the very authoritative and well researched site www.porcelainmarksandmore.com would categorise this mark in their fakes/repros section. To me these look well made and genuinely of the late 19th century period, yet this exact SM N crown mark is shown here on the fake mark page:- http://www.porcelainmarksandmore.com/resources/fake_n_repro/00.php (scroll down the page to just over half way down). The author gives no further explanation or identification of the maker, so this mark remains a complete mystery. The author does explain at the top of the page that the page also shows genuine marks which are often misrepresented, but I have never personally seen this particular mark before, so I don't think it can be one of those. I believe these pieces look too nicely designed and made to be reproductions or anything other than late 19th century pieces. However, if they are repros from a more modern firm like Sandizell, for example, they are very nicely done, but this firm was only established in 1951, in Post-War Germany. I have yet to see post war examples of Dresden lace ladies which are as nice as these. I have a sense that, with the bombings and carnage of WW2, the skills to make this quality of figure was lost. However, I am open to be contradicted on this, if anyone has evidence to the contrary. Many thanks for sharing your photos. Very interesting submission. If anyone can solve this mystery, please post below. Hello. I, also, have seen this mark on several of my antique pieces. 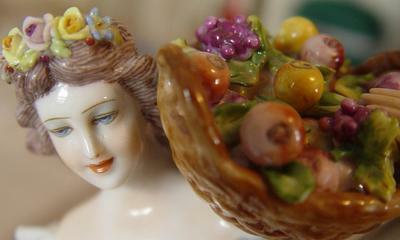 At first, I couldn't find this mark, so I just listed it as a Capodimonte piece. Then I found this mark: "crown, crossed sledge hammers, then the initials "S.M." The S.M. stands for Sommer & Matschak (1904-1945)from Bohemia (Czech.) Then again, I thought that Capodimonte merged with the factory of Sommer & Matschak, and that's why there was an S.M. and the Capodimonte "N". But according to "Porcelain Marks & More", it might be a counterfeit mark. Thanks for the tip about the Bohemian factory of Sommer & Matschak possibly being the 'SM' of this mark. This firm was established in a town called Schlaggenwald in Bohemia in 1904, and was formerly called "Anton Waldermann" after the original founder in 1901. They continued until 1945. I looked up this factory's marks in my various European pottery mark encyclopaedias and also checked with a couple of specialist German and Bohemian websites. Nothing doing on this particular mark. So, for me, this identification doesn't, on the face of it, look too good a possibility. However, I have to look at the evidence further to take a view on this mark. There is only one mark shown for Sommer & Matschak in a couple of variations and that is a simple Germanic crown with crossed hammers underneath and beneath that the letters "SM". 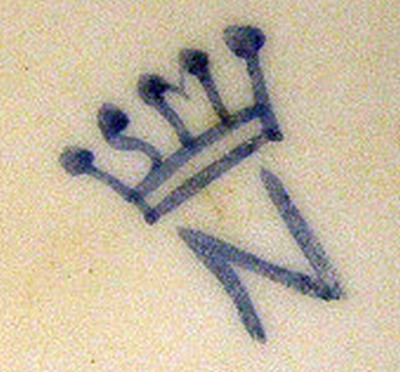 This mark was later copied by a firm also based in Schlaggenwald called 'Schlaggenwald Porcelain Industries' (no connection as far as Rontgen is concerned), but with the initials SM replaced with the letters HUB under the crown and N. This second Schlaggenwald firm traded from 1919 to 1928. The other thing is, Rontgen's lists Sommer & Matschak as mainly making household and hotel tableware and coffee/tea sets. No mention of figurines and decorative ware. This doesn't mean they didn't make figurines, but in searching, I only found vases, portrait plates and tableware attributed to them. Of course this doesn't mean they didn't make figurines, only that any figurines they might have made are not generally recognised as being their products, and also Rontgen don't recognise this factory as a figurine maker particularly. It is very feasable that they did have a figurine department at some time in their fairly short history, and marked these for export with the SM N Crown mark - but subsequently, none of the reference books or specialist websites have catalogued this mark as belonging to Sommer & Matschak. 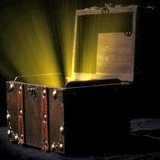 However, it is important to note that it is just this area of uncertainty and relative obscurity that the clever fakers operate in. Why fake a Ming vase when you can make clever reproductions of lesser known but respected makers? Added to this area of uncertainly, this mark is not helped in it's integrity by being listed in PM&M's fake marks section. N Mark with SM initials Real or Fake? The thing is, these two figurines are very nicely produced items and made with much delicacy, care and cost. 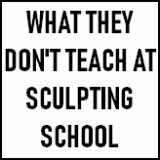 As a figurine maker myself, I know how much it takes to make a piece of this skill - and it is a lot of money (well over $100 USD per figure is the ex-factory price). The modern fakers of the Far East could make a Dresden style for less, but the quality would not be as good. Fakers simply do not have the time, skills or resources to make these items, in my view. And if they did there would be no money in it for them. All fake figurines I have seen in this Dresden style are literally horrible to look at. Cheap, bad modelling, awful decoration, bad design. C's models are both very well done with great detail and nice modelling skills. I did dome digging and found one of C's exact figurines had sold at auction in the US for $230 in 2010 at Premier Auction Galleries in Chesterland, Ohio. The auctioneer's estimate was $100 - $200. Not too much money in it if they are made by modern fakers methinks - why would you bother? The thing is, whether they are old or modern, made by Sommer & Matschak of Schlaggenwald or not, these pieces are worth $200 - $300 easily in my view. That's my professional view, but remember, I am not an expert, just a maker. The fact that C has provenance and these two items are of such nice quality, suggests to me they could indeed be by Sommer & Matschak of Schlaggenwald, Bohemia - who may have had a little known figurine department using an export mark. Now, the only area of difficulty I have with your contribution, Donna, is that you say "I thought that Capodimonte merged with the factory of Sommer & Matschak". I would like to know what you heard about this and where you heard it because this may snippet may well provide the conclusive evidence. If you remember, there is no such company as Capodimonte. Capodimonte is an Italian style begun by the Ginori (Doccia) factory at the very beginning of the 19th century when they began producing wares in homage to the old (and defunct) Royal Naples factory. Ginori of course never had the trade name protection for the Capodimonte brand name and so it got used by many subsequent factories with no connection to Ginori or Naples. It is therefore impossible for 'Capodimonte' to merge with anyone - but could you have heard about the export figurine department of Sommer & Matschak making N marked figurines maybe? Anyone with any further evidence or explanations, please post. I am actually C’s sister and I took one of those figurines to Antique Road Show when it was in Denver. They said it was German and worth about $500 or $600. At least I can pass it to my children and so on and in a hundred years it’s worth might go up substantially. Interesting you went to the Roadshow (presumably since C first posted the submission), and thanks for sharing your findings. The Antiques Roadshow analysis supports my feeling these figures are genuine despite the mark being on the fake marks section of porcelainmarksandmore.com and not listed in any of the specialist Bohemian websites or mark encyclopaedias. Remember if they were made by Sommer & Matschak of Schlaggenwald, this is Bohemian produce, not German - which is even better as Bohemian ware has more romance and artistry than German in many collectors minds. The value quoted by the Roadshow would be the retail/replacement price for each figure. Don't get too carried away because, unless you were lucky and had a very good listing description and good competing bidders on the day, the auction price you would obtain might be about half that retail amount - see the price I quoted of $230 USD in my last post when one of the figures was sold in 2010 in Ohio. Thank you so much for all the time and information spent researching these figurines. I was not sure if the post would be submitted as it does take some time. My sister in the meantime, decided to "cast a wide net" as my research yielded so little in our quest to find out what we could. The interesting thing about the Roadshow is that unless your item(s) are picked to be on TV they are mostly concerned with getting all those folks in and out. To give a fast dollar amount quote seems to be the end of the line. I know that is all some people are interested in but, it kind of misses the the most important part, in my opinion. Knowing who/where/when and the history is where the piece becomes much more than dollars & cents and after reading your posts, I have certainly taken another look even after so many times and imagine the man/men woman/women perhaps in little known figurine department somewhere in Bohemia, who took the steps in creating what I see as a moment in time caught in sculpture. She is in a new light, so to speak. Thank you again for the time spent. If there is any other information out there please know that it will be very much appreciated. I have a huge breath taking figurine with three lady's playing blind mans bluff with a gentleman with a crown mark and SM inside the crown too.Along with two other lady figurines with the same mark. I thought maybe the SM meant San Marco, Italy. I have a set of three figurines my great aunt left me. A cello player, a violinist, and a ballet dancer. Lace on some, all beautiful. My aunt was an antiques collector and died in her late eighties about 8 years ago. I have had no succes with origin, but I will cherish them. 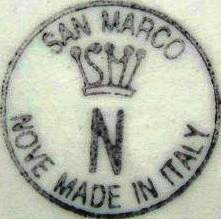 This is a San Marco porcelain mark, Italy. It's a real antique, it's not a fake mark!!! Was trying to find photos of San Marco figurines without any success. Do you or does anyone else have any photos of figurines like this with the same mark? Also, I had a question for Peter. In an earlier post you said you found one of these figurines that sold at auction in 2010. Is it possible to find out where or how I might be able to locate another figurine. I have a daughter and would like to add one for her as she could have one from each generation so perhaps she may add if she wishes as an adult?? Thank you so much in advance! I have several pieces and have investigated a lot on this mark. I have seen so many figurines with the identical lace, flowers, face features,the style of hair they have ,all of them have streaks in their hair,their dainty fingers,they all are exquisite pieces in detail. So the last figurine I have bought has all the same features as my pieces with the crown mark with the SM.This last piece actually says on it San Marco, Italy. I am an artist and I have an eye for detail and I promise that your piece is from San Marco,Italy.Now what company I do not know but as soon as I find this out I will re post. I don't profess to having great knowledge on Italian pottery, but I believe all Italian pieces HAVE to be marked Italy, if it doesn't say Italy then it is likely a copy. San Marco is an Italian maker. Here's another version of their standard SM N Crown mark. I can't find anything about them online - nothing. I considered the original 2 figurines to be Germanic in appearance. I just couldn't see them being 20th century Capodimonte figures (which have a different style altogether). 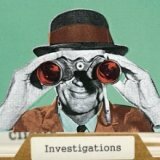 This website specializes in having information no one else has online. So, please enter some info if you now anything about the history of San Marco Italy . Thanks, let's do this thing! 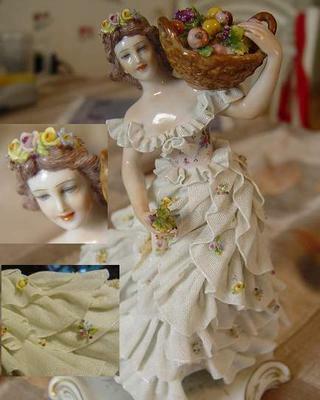 I have recently acquired this beautiful porcelain lace figurine that i won in auction for $66, I collect & restore porcelain lace so most of the time know what the marking is from. However, I had been stumped until I found this website. I brought it into my local antique store for more info and they said it was a Capodimonte and would go for $200-$250, but i still wasn't sure. So I also posted on a italian mark forums and they said it was a fake from china, but the quality of paint and precision is are far too good for this. I also took a trip to the library to look at some mark dictionaries and still nothing. Also, i had taken my look around the site and found there was the same mark over a "N" which is more like a capodimonte to me. Which i have seen before. However, this mark is different than that. I also took my fare share of look up online and still was at a loss. It also looks from the quality and chipping that it holds some history. Thanks for this discussion. Hope my post helps. I found this trade mark registered in NYC, NY. From any 1984-1996. I agree, this is high quality work, just not antique. Brilliant sleuthing, brilliant contribution. Thanks. Sadie, Upload them onto Photobucket and post the links on a new comment. I will take it from there. I have the same as the last photo posted. The quality is exquisite and very delicate. I don't see an option to post the photo or I would. Return to 7. China Chat - Italian, Spanish & Scandinavian Marks.